Tag line: "A Merry Musical Treat For The Whole Family!" Directed by Muppet master Jim Henson, Emmet Otter’s Jug-Band Christmas was, like Rich Little’s Christmas Carol, a regular staple of HBO’s Holiday programming schedule through much of the ‘80s. 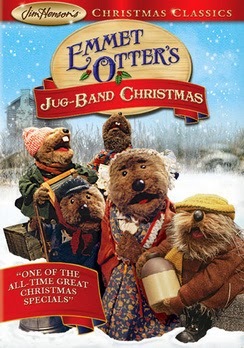 Intended to serve as a “trial run” for an eventual feature-length film (aka 1979’s The Muppet Movie), Emmet Otter’s Jug-Band Christmas has down-to-earth characters, a heartwarming story, and a handful of memorable songs. In order to make ends meet, Emmet Otter (voiced by Jerry Nelson) and his Ma (Marilyn Sokol) do odd jobs (laundry, mending fences, etc) for those who live along the river. Times have been tough for the two ever since Emmet’s Pa died, but thanks to the upcoming talent competition, which promises a payday of $50 to whoever wins it, their luck might finally take a turn for the better. Unbeknownst to one another, both Emmet and his Ma (each hoping to finally be able to afford a nice Christmas present for the other) enter the contest. A gifted singer, Ma intends to perform one of Emmet’s favorite songs, while Emmet, along with his pals Wendell Porcupine (Dave Goetz), Harvey Beaver (Jim Henson), and Charlie Muskrat (Richard Hunt), forms a jug-band. On the night of the competition, both do an excellent job, but are upstaged by a rock and roll group called the Riverbottom Nightmare Band, who will more than likely walk off with the main prize. Based on a 1971 children’s book penned by Russell Hoban, Emmet Otter’s Jug-Band Christmas features two extremely likable main characters: Emmet and his Ma. In the opening scenes, we spend some time with the two as they row their way up the river to drop off laundry, singing songs (like the humorous "The Bathing Suit That Grandma Otter Wore") and enjoying each others' company. Henson and his crew did a marvelous job creating the sets, giving this river community its own unique feel, and I liked the music as well, most of which was written by Paul Williams (including the very entertaining rock tune performed by the Rverbottom Nightmare Band), but like all of Henson’s best work, it’s the characters that make Emmet Otter’s Jug-Band Christmas so special. One of the rare Christmas shows that can be watched (and enjoyed) any time of the year, Emmet Otter’s Jug-Band Christmas has plenty of heart, and more than its share of personality.